Live in US and want a Z580CA? Hurry! Asus Store USA has in stock! Update: Oct 6, 10pm ET, Now showing in stock. The reason we say hurry? There must not be many available to buy, but certainly there are some available to buy. I think it’s safe to say this is the only place in the US where you can currently buy the Z580CA-C1 model. The true hero as it here. Price is $299 and they also have the ZenPad S 8.0 TriCover in stock. We aren’t saying this for nothing…if you want one, don’t hesitate. Do you guys know if there is ever supposed to be a 3g version of the hero tablet? No 3G or 4G LTE version that we’ve heard or read about. Perhaps in 2016? I guess it depends largely on price points. Just a small note about the web site not working with Chrome or IE, it’s not the web site but I adblock program I have called Hostsman, if you have problems checking out, disable this program if installed. If you don’t have it installed scrap this note. Sorry for the confusion. had to wait till I got home from work. This is BS. I got a ping saying they had them in stock at 1:07 PM and by 2pm when I checked my mail they were out of stock. WTF is wrong with their supply chain? I picked one up yesterday morning and it shipped in the afternoon. When I checked my order status in the afternoon they were already showing out of stock. I had pre-ordered with B&H on 8/19 and they were showing November for an estimate. It seems the only way to get these is to log in at the right time and right website. Attention today, Saturday 26, it’s available at Asus again. Sorry, out of stock right now 2:35 pm central time. I feel the were selling a few units only from cancelled orders in the last batch (This week sale). 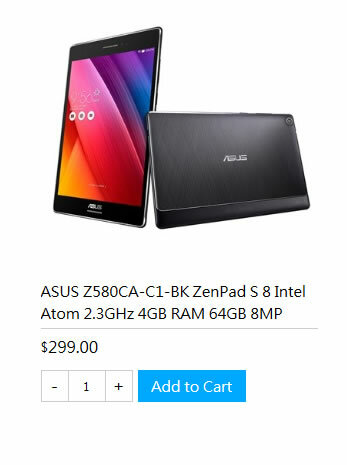 So I was able to get in last night 9/27 and get one directly on the asus.com website. I’ve shown a status of unshipped all day. Has anyone else ordered via this method? If so how long did it take to get your z580ca? Mine was shipped the same day, but after ordering from their web site, I got a email from Asus saying that my Credit Card company has to call them to confirm the purchase (? ), so check you email, spam too, to check for the mail, maybe is your case too. That’s funny I was blocked and I had to authorize it from my cc as well. I’ll give them a call, thanks Kekinash. It’s worth the wait. I’ve being using it since Friday and the tablet is smooth, great storage (54GB intern and a 64GB SD). I always encrypt my devices, so if I feel that the tablet is smooth encrypted, I figure that decrypted is gonna be faster. Only problem that happened yesterday was I shut off the tablet and when restating after introducing my password for encryption it got stacked at the Asus logo for long time, I tried to reboot, but no deal, after 3 times, it rebooted properly, but surely it was a moment of panic, he he. Hope doesn’t happen anymore. I know having the tablet encrypted can cause some problems booting, I got something similar with an old Samsung S8.4 tablet. I encrypted mine and same issue…only I gave up after 3 times and had to factory reset…encrypted again and same problem….now I gave up on encrypting….but at least I know it is not a HW issue. Any update on this, did you find a robust solution? Just bought mine and same issue here. I even hard resetted it and that did not help. I did that after I could not boot it up anymore….any solution? Hey huys. Ive been wondering for a while now about something. You know how the Zenpad s 8 does not have a big battery right, but the Zenpad 8 has a power case to improve on its battery life. Now Ive searched the web and found tablet cases with the battery built in to increase battery life. Here is my question. The Zenpad S8 seems to be popular, do you think another company(oviouly a company that makes tablet/ohone cases) may look into creating a case to help the tablets battery life?